Ideal gift, beautifully presented in a specially designed presentation box. 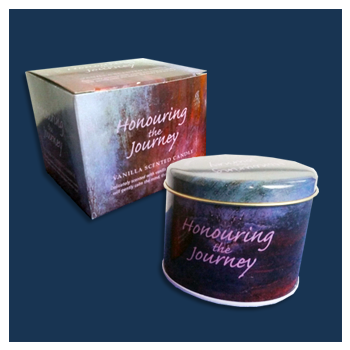 The box and candle container design were inspired by a painting donated to the Hospice by the Artist, Naomi Brosnan. As you open the box an inscription composed by Naomi greets you offering further thought and inspiration for your own journey.